Known for its good snow and few queues, the Saalbach-Hinterglemm ski area, easily accessed from Salzburg or Munich, has always been a favourite Austrian winter sports destination. In recent years it has also reinvented itself as a first-class summer resort. This recently refurbished chalet apartment, offering comfortable accommodation, is located in a central, yet quiet, part of Saalbach. The ski bus connecting the Saalbach and Hinterglemm lift systems stops close by but it is an easy five-minute walk to the centre and, best of all, the apartment is just 600 metres from the main lift, the Schattberg Xpress. 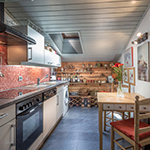 The two-bedroom apartment, situated on the top floor of Haus König, a traditional wooden, three-storey chalet, sleeps four to five adults. And, because it is the owners’ own holiday residence, the property is very well-equipped. Cosy living room – There is a large comfortable sitting area with a fabulous view and a stove for those cosy evenings in. For entertainment, there’s a good selection of books and games and a satellite TV with a webcam service showing current mountain conditions and up to date weather forecasts. There is also a traditional corner dining area with a modern look. Comfortable sleeping arrangements – Both bedrooms have plenty of useful wardrobe space. The master bedroom has a great view, a walk-in wardrobe and a king sized Austrian-style bed. The second bedroom has twin beds. The sofa in the living room can be used as a single bed for a fifth person. 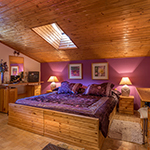 Washing and bathroom facilities – The Master Bedroom has its own wash basin and vanity unit. The bathroom has the luxury of a bath, as well as shower, for soothing those aching muscles. utensils and equipment, including fondue and raclette sets for traditional meals in. 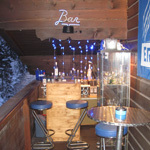 South-facing balcony – There is a large, sunny sitting area and an amazing Ice Bar with views over the river to the main mountain and Shattberg Xpress lift. This is a great place to soak up the sun or to enjoy a sundowner at the end of the day. Good storage facilities – The hall has plenty of hanging space for ski wear and storage for outdoor shoes. Ski and boot storage is provided in the basement of the chalet. Alternatively, for a modest fee, you can store your skis, boards and boots at a ski rental shop in the resort centre near the main lifts. 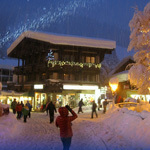 For non-skiers, there are cafes, bars and shopping to suit all tastes. An hour by train from the nearby town of Zell am See can take you to the historic city of Salzburg, Mozart’s birthplace, where you can experience many events. In December there is the famous Christmas market or why not try a Mozart dinner evening. Music lovers will enjoy this extravaganza of music and fine food. The area has stunning scenery with 400 kilometres of marked paths for hiking. Golfers can enjoy the two top class courses at nearby Zell am See and Kaprun. Lift systems operate in the summer for hill walkers and mountain bikers. Cyclists are well catered for with miles of marked biking paths and free train transport for their machines makes it possible to experience other valleys in the area. Cycles and other equipment can be easily hired in the village. White water rafting, canyoning, and climbing can all be arranged through the excellent local tourist centre.